Unlike my cousin Tally, I have a strong sense of personal style. 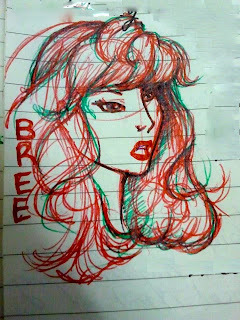 I keep up with the trends, but I always put a distinctly "Bree" spin on them. Even in the early 90s, I found a way to add some bombshell to the grunge: I just tied my flannel shirts under my bosom, unbuttoned my henleys to show a little cleavage, and wore them with a cute denim mini instead of those shapeless jeans everyone else picked. Ick. The heart of my look, of course, is my hair. The good Lord blessed me with a full mane of bright red hair. Not auburn or strawberry blonde, but stop-light, cherry-on-top, capital R-E-D, red. Once, I heard some mousy blonde call it "hussy hair." I just smiled. You can imagine my horror when I discovered my first glimmer of gray in my crowning glory. Of course, that first gray was just the beginning. They multiplied like bunnies on Viagra. So I found myself in a bit of a pickle. I used to smirk when I'd see women with platinum or ruby hair and roots the color of week-old cow pies. But, me? Go gray? No way in holy heck. What could I do? I slapped a pair of Jackie-O sunglasses on my face and a ball cap on my head ... then I hightailed it to the drug store in Possum Point (about 20 miles down the road) to pick up a box of Berry Blitz hair dye. My daughter, apple of my eye and fruit of my loins, declared me "vain." I pointed out that she could start judging me the minute she had a credit score, a car payment, and stretch marks from birthing a smart aleck child. But part of me thought maybe she had a point. Should I wear my gray hair with pride? A sign that I've lived hard and made it through? Or is it o.k. to indulge in a little chemical sleight of hand? With an unnamed actress suing IMDB because they disclosed her actual age, where do you stand? How far are you willing to go to trick Father Time? 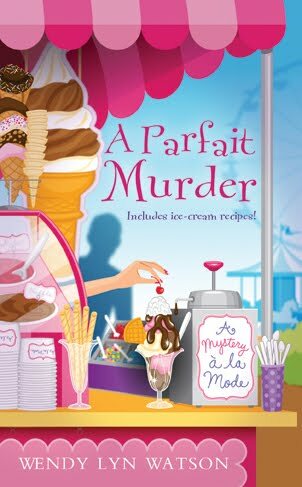 Find out more bombshell Bree, her smarty-pants daughter Alice, and long-suffering Tally in I Scream, You Scream, Scoop to Kill, and A Parfait Murder. And be sure to visit Wendy on her website and on Facebook. I love this series and have read them all already. Bree, you go girl and wear whatever hair you want ! I'm all for trickery. Keep that red, Bree! I like to match my hair color to my outfits. I don't wear much gray, but silver decorated with crystals--now there's a look! You've got to go with whatever makes you feel like a diva, Bree. Go for it Bree - until you're almost old (like with wrinkles that don't firm up with goo) then see what 'natural' actually looks like. You may find that a few gray streaks are stunning. Then go easy on the painted-on eyebrows. 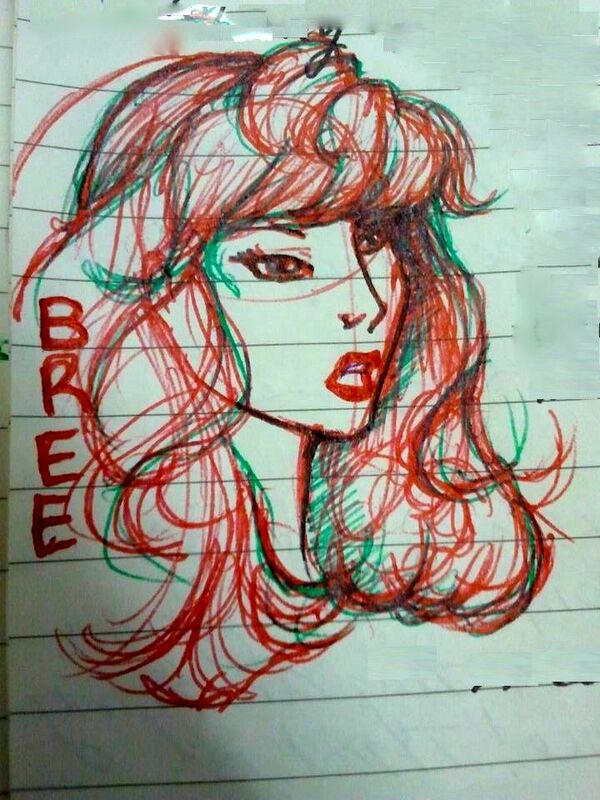 Bree and Red go together. Get that box and wear it proud. Leave it alone, nothing wrong with gray. Be proud of it, because it shows you've lived right. My Grandmother use to dye her hair all the time, so we talked her out of it, and turns out she had the prettiest white hair you ever saw. We called her Cottontop. If you lost her in a store, all we had to do was look for that Cottontop! I've actually opted for the best of both worlds: I just got my hair colored to get a little "pick me up" for the colder weather, but I had the colorist keep the impressive fringe of white I have right at my hairline. I sorta love it!